Those waiting to scratch that snow itch can finally get some relief now that winter is here. But despite healthy early season winter storms, the Sierra Nevada snowpack got off to a below average start this winter in the year’s first snow survey conducted by the Department of Water Resources. The survey showed that the statewide average for the Sierra Nevada snowpack is at 67 percent of its normal average for this time of year. It wasn’t too long ago that a five-year drought devastated California, which left ski resorts in Northern California reeling. Many had no choice but to make snow to fill in for the detrimental lack of water. This dramatic decline in the Sierra Nevada snowpack has been linked to climate change. The window of time that skiers and snowboarders get to spend on the slopes will get progressively smaller, said Paul Ullrich an assistant professor in the UC Davis Climate and Global Change Group. Part of Ullrich’s work focuses on modeling future climate change scenarios for the Sierra Nevada snowpack. This year’s snowpack level doesn’t alarm Ullrich and he stated that the current level of precipitation, which sits at about 70 percent of its normal level, translates to a pretty healthy snowpack compared to some of California’s drier years on record. “Over the past decade what we’ve been seeing is these anomalously warm temperatures that have just persisted through the winter season,” Ullrich said. He has two key takeaways from the arrival of these warm temperatures. This isn’t just a problem in California, however, nationwide ski resorts are projected to have their seasons clipped with slopes at 3,000 feet and below to be hit the hardest, according to a 2017 study. 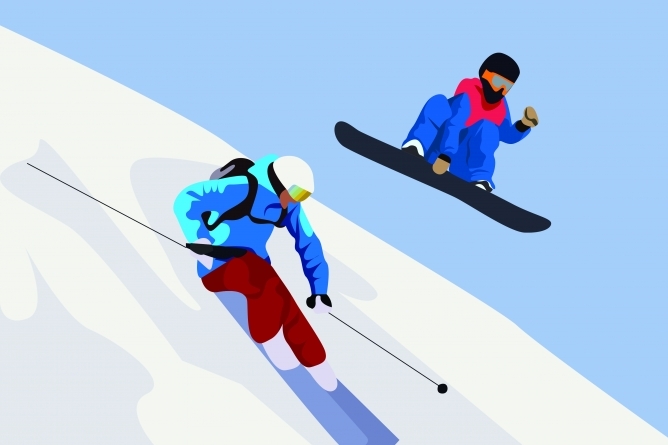 Ski bums will delight in the fact that a good chunk of the resorts in Northern California are situated anywhere from 7,000 to 9,000 feet and are more resilient to the temperature increase due to climate change. But those resorts at higher elevations will still lose anywhere from 10 to 40 percent of their snowpack by 2050 based on Ullrich’s research. This range comes from both the variability of the environment and human activity. Ullrich believes there isn’t really much we can do to alter our path. “On our current trajectory we are pretty much locked in,” he said. Current assessments paint a stark view for the Sierra Nevada snowpack. This will affect not only the ski industry but also water management issues. At this point, experts believe it is not so much a problem that can be solved and is only a matter of time before weather patterns alter our way of life.